Unpredictable stories that will keep you guessing. The Man Who Built Boxes and other stories is a book that will keep you guessing and pondering from start to finish. 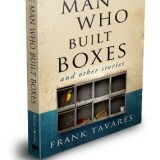 The Man Who Built Boxes and other stories is a volume of short stories by a single author, Frank Tavares. Featuring a variety of tales ranging from strange to sorrowful, they offer bite-sized bites of fiction to readers who don’t have the time or inclination to get sucked into something bigger. Short as these stories may be, though, each offers a fully fleshed tale that will keep you engrossed from start to finished. The stories in The Man Who Built Boxes are as varied as they are unpredictable. The first, My First Ex-Wife’s Third Wedding, is a thoroughly modern tale of a man attending an ex-wife’s first marriage, meeting up with both her and another ex-wife for an unusual trip down memory lane. Each of the other short stories are equally unexpected in their focus, and yet the quirky characters are so believable in both their shortcomings and their determination to keep going. From the heavily inked runaway fleeing from yet another failed relationship, to the sad yet quite deranged couple who want nothing more than to off each other, it is a look inside the dark side of human nature. If you’re looking for an uplifting read, you won’t find it here. Each of the stories in The Man Who Built Boxes either have a sinister twist, or are dark right from the start. They aren’t depressing, though; more, they are thought provoking in a way that is both unexpected and refreshing. While they won’t leave you smiling, they will definitely leave you thinking their unforgiving depiction of the many layers of the human condition. While the stories themselves are not always something you can picture yourself in, the characters and their often heartbreaking situations pull you in with the realism of their emotions and reactions to the world around them. 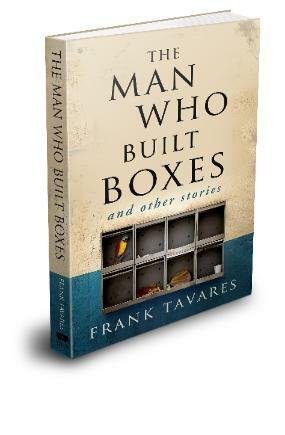 The Man Who Built Boxes and other stories is a book that will keep you guessing and pondering from start to finish. From a misunderstood woman in a box to a melancholy old man who yearns for what might have been, the characters created by Frank Tavares are as unpredictable in their actions as they are unforgivably real in their thoughts and feelings. Far from a happy read, The Man Who Built Boxes is an intellectual one instead. My biggest complaint is that it only leaves you wanting more.